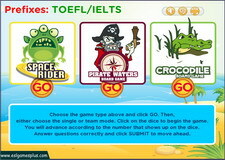 Root Words Game for Word Building: Practice root words game for word building by playing this interactive ESL board game. Students who have good mastery of root words and their meanings in English will often have skills for attacking unfamiliar words especially during exams like IELTS and TOEFL. English has borrowed words from many languages especially from Greek and Latin. 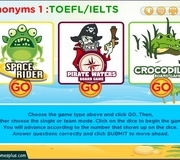 Choose whether to practice root words game for word building by navigating a treacherous galaxy filled with green monsters, a sea filled with pirates or a river filled with crocodiles. 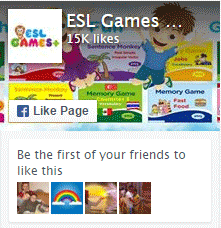 Either way this will keep your heart pounding. Suddenly English grammar practice is no longer boring with these games.